Tool station holds 8 tools using standard long type Wilson or Mate turret punches. 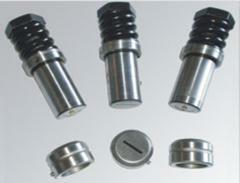 For over ¼ plate we supply our heavy duty punches. 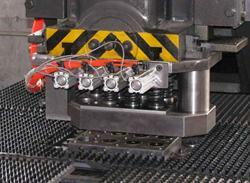 Each punch is selected by the CNC and a pneumatic actuator enables the selected punch to be struck. CAD software can be programmed in G Codes and can automatically transfer and generate a program from CAD graphics. ON Screen graphics display for punch path and product drawing. Punch cavities are same as Thick Turret type. Tool library stores huge selection of dies. Complete overload protection of ram. Adjustable bottom of stroke for smooth break through. The table travels with the plate on X and Y and reduces movement of the ball units. 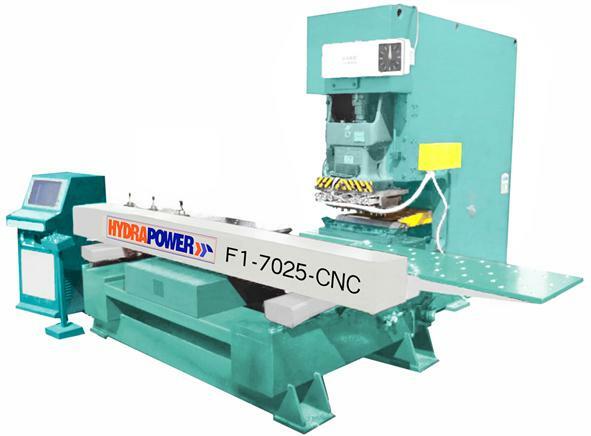 The CNC is mounted away from the punch frame to eliminate vibrations in the circuit boards and screen. Circulating lubrication on ram and linear guides.